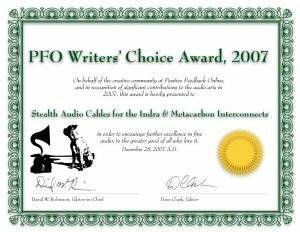 The Metacarbon (metallized carbon) is our attempt to design a cable to come reasonably close to the Indra performance, but using more common materials than the ultra-exotic amorphous Indra alloy, and thus at a more affordable price. Our metallization process specifically aims at the best treble extension possible, while keeping the purity, neutrality and other benefits of the pure carbon signal path. 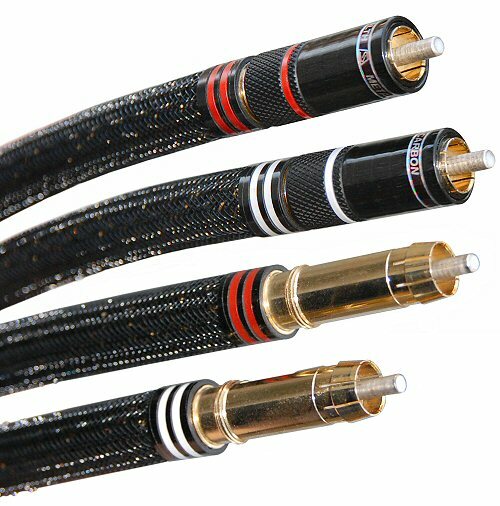 The proprietary STEALTH RCA connectors originally used with Metacarbon were ultra-light - similar to the early Indra (revision EP) connectors, but the outer shells on the Metacarbon cables featured three stripes color coding for a distinctive look. While sonically very good, these connectors couldn't withstand numerous installations, and lost their grip on the RCA female with time. 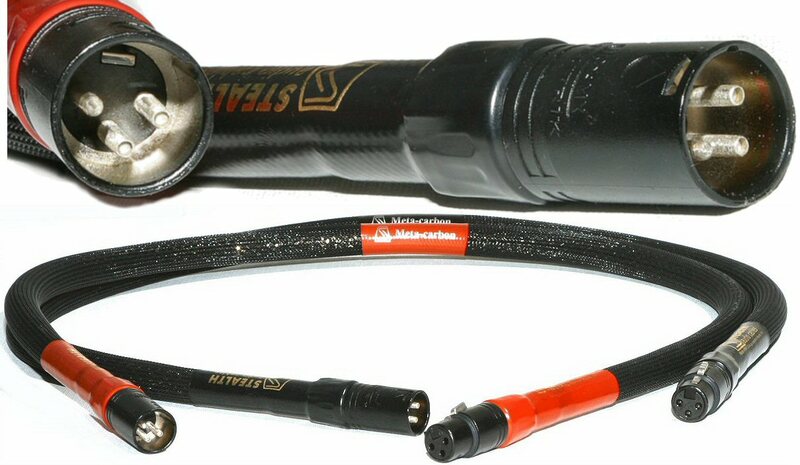 The connectors used for the balanced XLR revision EP Metacarbon were sourced from Neutrik of Switzerland. 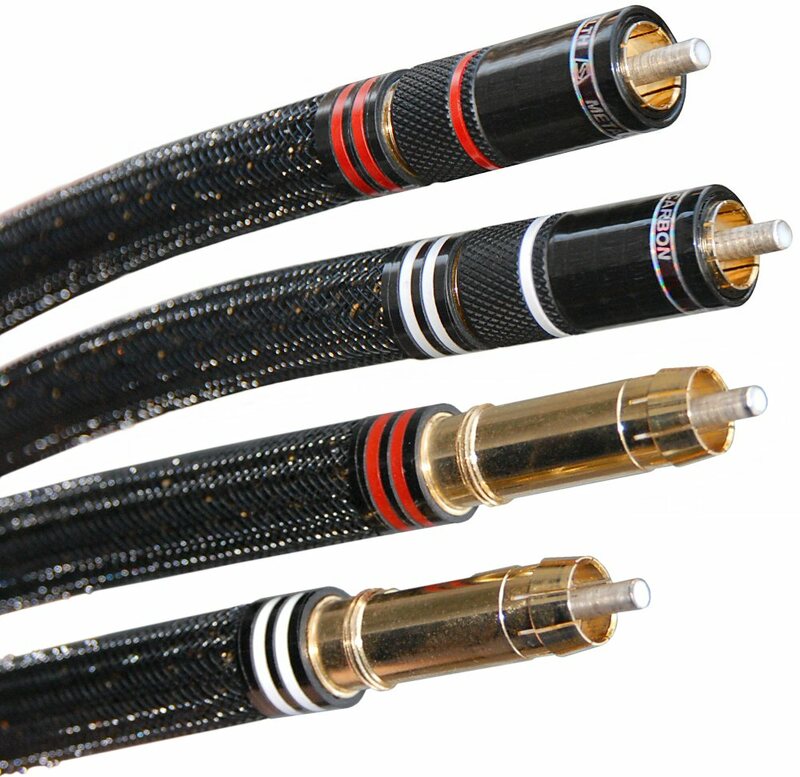 The full production (REVISION "P") made until early 2009, featured STEALTH designed LOCKING RCA connectors (Teflon dielectric, solids silver center pins, machined brass/carbon fiber shells, and gold plated brass ground/return RCA contacts); these locking RCA connectors provided a better grip than the previous (EP) Metacarbon RCAs, and kept their performance when the cables were moved (installed and removed) at least one hundred times. 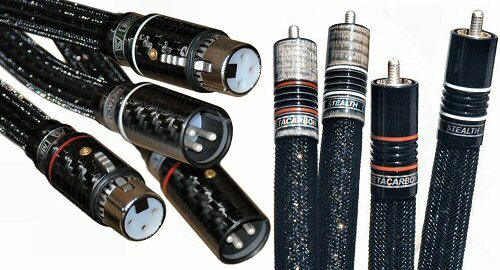 The connectors used for balanced Metacarbon were modified Neutrik XLRs. The latest Metacarbon cables, introduced in 2009 (REVISION 09) are shown below and feature our newest proprietary connectors (both RCA and XLR): machined carbon fiber shells, solid silver XLR contacts and RCA center pins, solid silver ground/return for the RCA connectors, and Ultra-modified PTFE (Teflon) instead of the conventional PTFE. 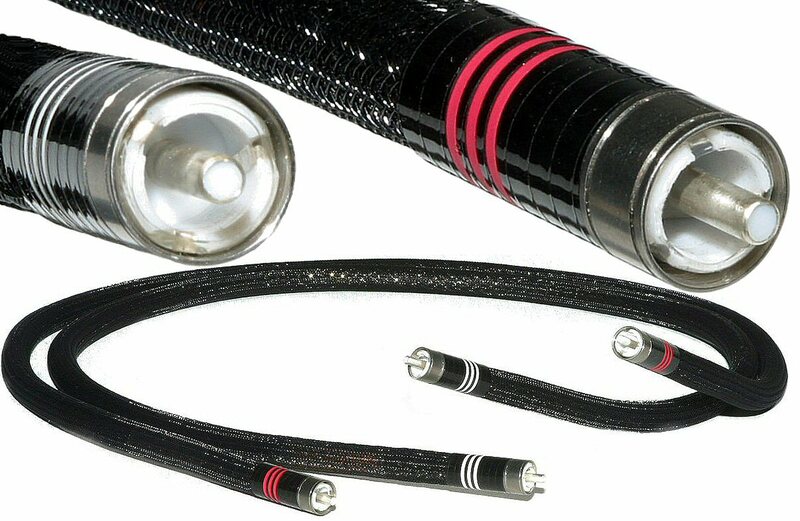 The Ultra-modified PTFE offers superior dielectric properties (reduced permeability and a lower dielectric constant - which offer even lower energy storage and further reduced "crossover-type" distortion in cables and connectors), better mechanical characteristics (significantly lower deformation under load, higher elongation and tensile strength - these qualities improve the "grip" of the STEALTH connectors on the chassis mounted counterparts), plus a pore-free and extremely smooth surface - preventing contaminates from being trapped in high purity applications. Appearance-wise, the Ultra-modified PTFE is similar to the PTFE, the only visual difference is a shade of blue in the Ultra-modified version. As the result, the Metacarbon revision 09 sounds more refined than before, plus - due to the solid silver RCA ground/return - the RCA-terminated Metacarbon is measurably quieter, plus the new, revision 09 RCA connectors are shorter, and thus are more convenient to use, and easier to connect and disconnect than the earlier revision(s). ** We continuously improve our cables and connectors, and add improved and extra features to our products – as we design and test these improvements. The general sonic character of the cable remains the same, it just becomes progressively better and better.